After a wonderful week of farm-themed play and craft last week, as well as a failed trip to an actual farm, A and E were keen to continue the theme this week. I wanted to change it up slightly though – mummy doesn’t do very well repeating the same thing over and over for weeks on end as she gets a bit bored, so I made a new and improved sensory tray. I also wanted to add a little more challenge to the play, so I created a couple of extra resources to start us off. And, by created, I obviously mean I downloaded and then printed them from Twinkl as I have neither the time nor the ability to think up good resources like this – I pay Twinkl a very reasonably priced subscription for the pleasure (and it really is worth it). However, the resources that we used are very simple indeed and would take no time to make for yourself, if you had any to spare. We simply started with a sorting game, sorting a selection of minibeasts, sea animals, wild animals and farm animals. We discussed the differences between the different types of animals, as well as their habitats. We then focussed on the farm animals, and played a guessing game, taking it in turns to describe/act out an animal for the rest of us to guess. After this I had a nicely differentiated matching game. For E it was matching up pictures of animals, whereas for A it was matching names of the animals to pictures (with the names underneath). She is really getting to grips with her letters (not that I can take any credit as it is all pre-school’s doing), and is very confident with so many of them that she enjoyed the challenge of trying to match up entire words. She also thoroughly enjoyed having a slightly different activity to E! When they were tired of this I set up the tuff spot. This week I decided to use only breakfast cereal (bar a couple of cannelloni tubes), in order to make the entire scene edible; this also meant that waste was prevented/minimised (as much as my children love play like this, I do feel incredibly guilty wasting so much food “in the name of play”. Therefore, I try to save as much as I can, if possible). We used shredded wheat again, as it makes a brilliant texture when crumbled up, porridge oats, Rice Krispies and Cheerios. We also added Weetabix later on. To start with I let A and E explore and add the animals and vehicles that they wanted. A also remarked that we needed water for the ducks, so we added tissue paper again. It was interesting to see E add his construction vehicles (rather than animals) and wheel them around, shovelling the cereal in the process. He realised that some of the vehicles could be filled and then emptied, and that each made different marks in the cereal when pushed around. He also enjoyed pouring the cereal through the cannelloni tubes and watching it come out of the bottom. A played with some of the animals for a while, pretending to feed them and wash them, and enjoyed creating a pond for the ducks by ripping up the tissue paper (clearly my version wasn’t good enough). She explored the different textures (and tastes) of the cereals, as well as the different sounds that each made when sprinkled through her fingers and dropped into the tray. However, as usual, it wasn’t long before she headed to the play kitchen to see what containers she could use. She decided on a cutlery tray and filled it with each of the cereals, as well as the ducks, and served it as dinner (those poor ducks; they always end up as food). After a while I decided to introduce some Weetabix. I suggested that the biscuits could be used as fences, but they weren’t very impressed. E decided to just sit and eat them, whereas A broke them up and decided to use them as hay bales. She tried to stack them, and she counted them a few times, but in the end she simply crumbled them up to feed the animals with. Once they both grew tired of playing we read as many farm- and animal-related books as we could find, including a version of “The Three Little Pigs” that A had borrowed from pre-school for the week (more on this another time). This theme has so much potential and I think we will continue to explore it for the rest of this week! What a fab small world. Can’t beat cereal in the tuff spot for lots of fun imaginative and sensory play. 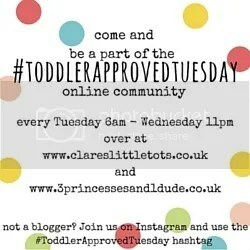 Thanks for linking up to #ToddlerApprovedTuesday.